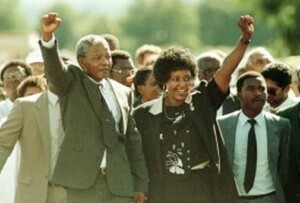 On Monday, former wife to “Political Hero” Nelson Mandela, Winnie Mandela, passed away at the age of 81. Controversy. Biggest understatement of the century. She was far cry from Mother Theresa to put it lightly OR a horrible human being who kidnapped and killed a 14 year old boy a year after Nelson Mandela’s release from prison and is responsible for many cruelties such as “Necklacing” folks to death to put it harshly or in this case–realistically. She will be remembered for her fight against an inhumane system, rather than for the mistakes she made in that fight. In response to the killing of the 14 year old boy, Mandela “always denied the allegation, and the sentence was reduced to a fine,” as stated by BBC News. Perhaps, the rest of the world is correct in forgetting her murderous past in South Africa. 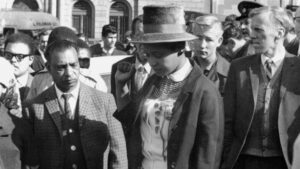 After all this was during a time of Apartheid of which she and Nelson Mandela fought against. How’s South Africa today? It appears South Africa has substituted their former Apartheid with another—this time against its white citizens. “White South African farmers will be removed from their land after a landslide vote in parliament. 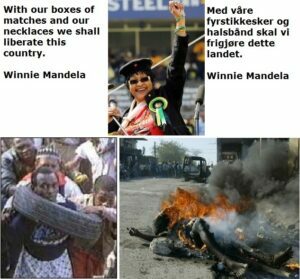 Nelson Mandela and Winnie Mandela’s anger and resentment has stained South African soil with their racist and marxist policies. The story of South Africa’s current state of race based terrorizing of its citizens can be seen in Lauren Southern’s documentary, Farmlands.